The Gulf of Corryvreckan is home to the world's third largest whirlpool area. The formation of whirlpools in the Gulf of Corryvreckan is a tidal phenomenon – it is important to note that the whirlpools are not always present ! IF YOU WANT TO SEE SOME WHIRLPOOL ACTION (many people prefer calmer conditions !) PLEASE ENSURE YOU LET US KNOW WHEN YOU CONTACT US SO, WE CAN ADVISE YOU OF THE LIKELIHOOD. We have 2 tours that regularly pass through the Gulf of Corryvreckan – our Whirlpool Special Tour and our Corryvreckan Wildlife Tour. 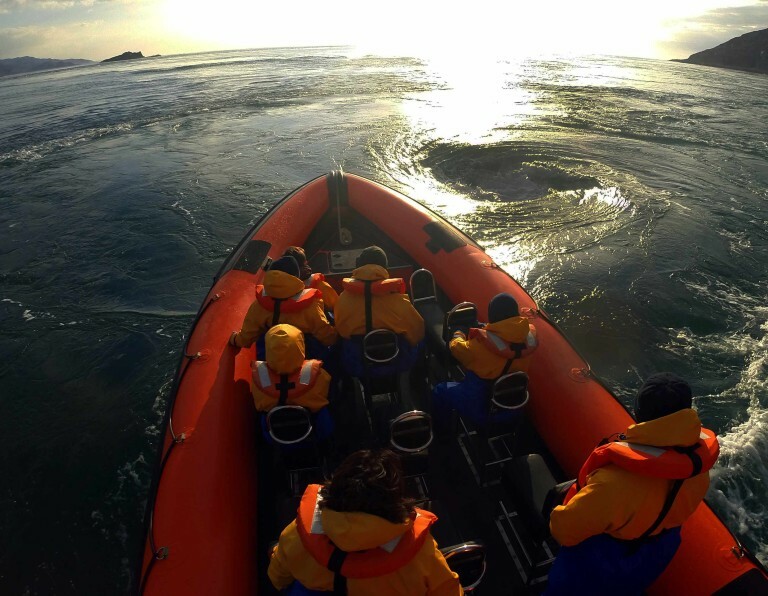 These tours (1.75hrs) are specifically designed to see the Corryvreckan Whirlpool area at its most active – the focus of the trip is purely to enjoy the spectacle of the tidal action. We do not run these trips on a daily basis. We publish the dates and departure times on the Whirlpool Special Tour page, as we need certain tidal conditions to see the whirlpools at their best. These 2 hour trips focus on wildlife however they do pass through the gulf of Corryvreckan. Depending on the tidal conditions at the time of departure it is possible there may be some whirlpools or the conditions may be completely calm, we often find that calmer conditions are better for wildlife sightings in the Gulf. Our ticket office team will be able to tell you whether the likelihood of tidal activity is high or low. When is a good time to see the whirlpools ? The best time to see the tidal activity in the Corryvreckan is during big spring tides, this does not mean during the spring months but when we have a new moon or full moon. This happens approximately 30 times during our operating season. What other factors affect the whirlpools ? Each time we visit the whirlpool area it is different, the tidal range (difference between high water and low water height) plays a part, the wind strength and direction can affect the formation of the whirlpools and also the sea swell. The time of departure during spring tides also affects the type of tidal activity you are likely to see – If we depart at high water (as we do for Whirlpool Specials) you are more likely to see defined whirlpools and upwellings, if we depart at low water you are more likely to see dramatic standing waves. Like we said, it’s different every time ! All of our tours (excluding the day trip to Iona, Staffa and the Puffin colony) visit the Corryvreckan Whirlpool area. Please note - viewing the whirlpool area in the Gulf of Corryvreckan from the comfort of Celtic Adventurer will not give the same experience as on our open RIBs, which go right into the centre of the whirlpools.